You didn’t think the people would love it, did you? Copright of Iain Dalton. 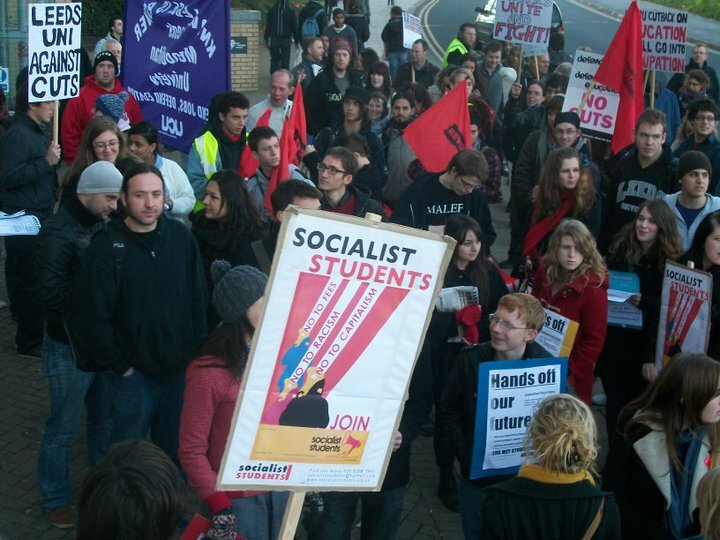 Protestors march in Leeds. I spoke to Conservative MP Guy Opperman yesterday who said, “I think most people are happy, and understand that this was something we had to do for the state of the British economy”. How wrong he is. Public sector workers including nurses, teachers, librarians, firefighters and other employees will take part in rallies and meetings all over the country. With the review claiming 490, 000 public sector jobs, I do question those Tory voters under some kind of romantic illusion that things will miraculously become better under the coalition. Today I spoke to Yorkshire Organiser for Youth Fight For Jobs who agrees that the most shocking feature of the cuts is the loss in public sector jobs. “Over the last few months we’ve already seen voluntary redundancies within the public sector that mean that services are already stretched to breaking point. The idea that the private sector will somehow ‘take up the slack’ is nonsense – most of the growth in the private sector will come from the governments plans to contract out / privatize more council services – which costs us more. “We have a huge crisis for young people at the moment. Youth unemployment is around a million – due to the lack of jobs, and now they plan on scrapping the EMA and raising tuition fees which will price thousands of students, particularly from a working class background, out of education. There’s a massive danger of young people today becoming an abandoned generation”, adds Iain. Granted, the Labour government weren’t perfect. 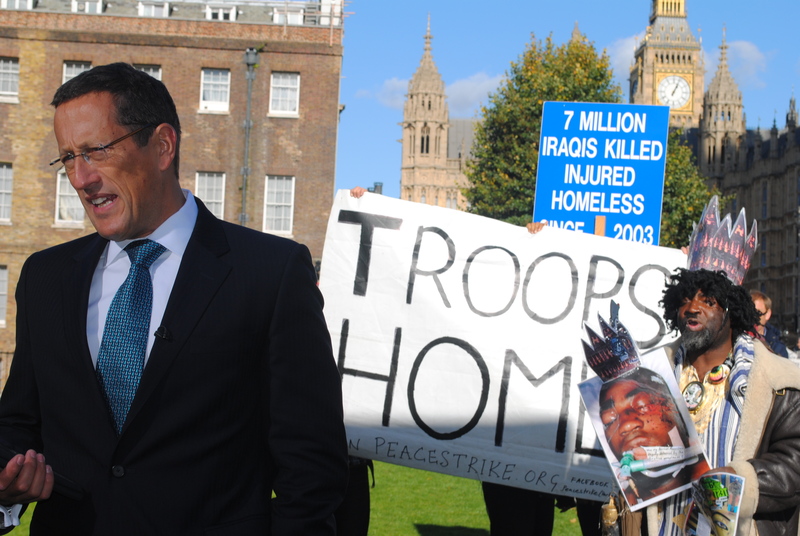 However, I am with the anti-war protestors who gathered at College Green yesterday to demonstrate the real loss in government funds: The £2.6million per year war in Afghanistan. What sickened me was the response these people got from surrounding viewers, the quite blatant Tory’s with their smug head shakes. When I was interviewing one protestor I was briefly distracted by the titter of one man behind me, who shook his head in mocking at these people making, in my belief, a righteous stand. The protestors peacefully stood behind an extremely rude CNN presenters with their banners saying “Stop the war, not the poor”. They weren’t saying anything particularly controversial, they were simply making their presence felt. The utter atrocities they received from surrounders, you would have thought they had come on television denying the Holocaust. People pushing them, the CNN presenter swearing at them… I felt the urge to join the protestors. Chatting to one, he so fairly said, “I don’t want to put blame on anyone. I just want the troops out like so many other people do”. The CNN presenter completely over reacted, and acted like a small spoilt child, storming off ranting “CNN won’t be happy until I get hit over the head”. Ahh boo boo. Amongst the protests, a group of demonstrators have occupied a bank in Glasgow today. Members of Citizens United gathered in front of the City Chambers at around 11am before walking into the Lloyds TSB Scotland branch in St Vincent Street in the city centre. The group had 11 demonstrators, including pensioners, shouting “no cuts, no cuts!”. This clearly shows that it is not the Labour government that many (namely Tory leaders) blame for the economic crisis, but the greedy bankers. “I have huge worries about the future of my education. The cuts to the university teaching budget means that the quality of the services offered by my university, which is a predominantly teaching institution will suffer, and will most likely be facing closure of one or more faculties in the year to come. “This is a disgrace as it means less of a chance for young people in a time when jobs are scarce and applications for apprenticeships are through the roof. It is hardly investment into the future when at the same time bursaries are being cut, and tuition fees are being raised”, adds Millie. Yesterday morning I spoke to an old man campaigning against the cuts. He said that he had given a leaflet to MP Kenneth Clarke, who proceeded to walk away from him. I am sickened to think that a politician would simply ignore this war veteran with his peaceful handing over a leaflet. The protests show that ordinary groups of people are prepared to make a stand against the unfair cuts. To find out more about the cuts watch this video.